The BBC will have to name all employees and presenters paid more than £150,000 a year, culture secretary Karen Bradley has said. The clause will be included in a draft of the BBC's next Royal Charter. Currently, the BBC only reveals the salary details of executives who earn more than £150,000, but the government wants it to go further. But BBC Trust chairwoman Rona Fairhead said the move was not "in the long-term interests of licence fee payers". Speaking in the House of Commons on Thursday, Mrs Bradley said publishing the salaries would bring the BBC "in line with the civil service" on transparency. The culture secretary said it would help ensure the BBC "produces value for money for the licence fee" and that more transparency could lead to savings that could be "invested in even more great programmes". 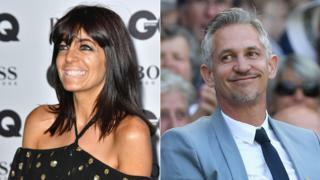 Strictly Come Dancing host Claudia Winkleman - one of those expected to be on the list - said last week she was "all for" BBC stars' earnings being disclosed because they are "working for the public". The BBC has said releasing stars' salary details would affect its ability to attract and retain top talent and that it has already cut the amount it pays its broadcasting stars by £8m. Mrs Fairhead said: "We don't agree with the government on everything and are disappointed with the decision on the disclosure of presenters' pay. We don't believe this is in the long-term interests of licence fee payers." Last month, a spokesman for the corporation said publishing stars' salaries would amount to a "poacher's charter" - which would give competitors an advantage, allowing them to make better financial offers to attract talent away from the BBC. But the corporation must now publish the salary details of all of its staff, including on-air presenters, who earn more than £150,000 - and specify which £50,000 salary band they fall in to - in next year's annual report. Director general Tony Hall said: "Our position on talent pay has not changed and all major broadcasters have questioned the merit of the proposal. "The BBC operates in a competitive market and this will not make it easier for the BBC to retain the talent the public love." The lower threshold will increase the number of current stars whose salaries will be made public from seven to 109. The culture secretary also gave more details of the new unitary board which will oversee the corporation - replacing the external BBC Trust and the internal BBC Executive. Mrs Bradley said the new board would be made up of 14 members - nine of which would be appointed by the BBC, plus five which would be public appointments. The BBC Trust currently has representatives for Scotland, Wales and Northern Ireland on its board - something the culture secretary said would still be the case on the new unitary board. However, she said, the appointment of the representatives from Wales and Northern Ireland would now be agreed with their respective administrations, as is currently the case with Scotland. She said: "The BBC serves all nations and regions. It needs to be more reflective of the whole of the United Kingdom." Mrs Bradley also told the House of Commons the decision to introduce an hour-long TV news programme in Scotland would be a matter for the BBC. Mrs Bradley also thanked Mrs Fairhead, who announced earlier this week she would step down early from her role as chairwoman of the BBC Trust, for her service to the corporation. Mrs Fairhead had originally been asked by the government, under David Cameron, to chair the new unitary board once it was set up. But it is understood Prime Minister Theresa May wished to open the job up to other candidates to make the appointment process more transparent. The Royal Charter is an agreement with the government over what the BBC intends to do over the next 11 years. It is a general document outlining how the corporation is funded, how it is run, who holds it to account and what its broad objectives are. The White Paper, published in May, set out reforms to governance of the BBC, including abolishing the BBC Trust and the setting up of a board to run day-to-day matters, with Ofcom as the external regulator. The current Royal Charter is due to expire at the end of 2016. The BBC hit the headlines earlier this week when it lost the rights to one of its most popular programmes, The Great British Bake Off. Channel 4 gained the rights in a three-year deal after reportedly offering £25m per year for the show - £10m more than the BBC.